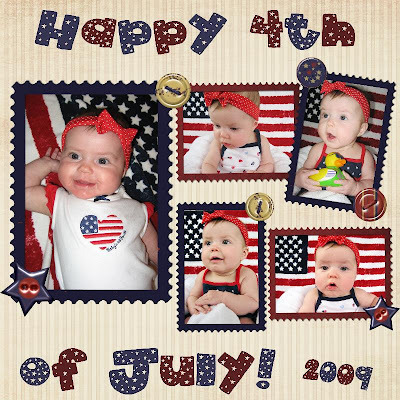 I am entering this photo in the I ♥ Faces weekly photo contest. Kaitlyn's (at 3 months old) first trip to the beach in Canoa, Ecuador. Ron's Mom and our sister-in-law, Barby, took the trip out to visit Kaitlyn in Quito. (Let's be honest, they weren't there to see Ron and I!) :) We had a fun-filled week and took them to see all the major sites. Day 1: Mitad del Mundo (the equator... middle of the world) This is the monument marking what was thought to be the equator before the invention of the GPS. We stopped to have lunch at Yaravi. 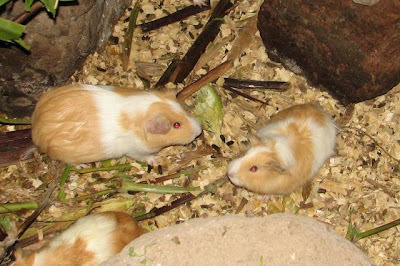 Ron was excited to finally taste the much-hyped local delicacy--cuy (pronounced coo-ee)... ...which, in English, means guinea pig...as in the common household pet in the U.S. Before: And after. Yes, he/she still had chin hair and a few teeth. Yuck! Kaitlyn wasn't sure what to think about it. Ron and Barby decided to split the meal. Afterall, it's not cheap. $18 for the plate you see. Here's video of all of us trying it. Mom T looked like she might lose her lunch! After Barby tried it, she decided she didn't want much more, so she ordered a chicken sandwich and Ron finished off the cuy. He'll eat anything! Kaitlyn lookin' cool after lunch. She's got Daddy wrapped around her finger! After that huge smile Daddy couldn't resist buying the bear for her. All smiles for Tia Barby. At the real equator. No one else could balance on the equator line, but with Daddy's help Kaitlyn did it. 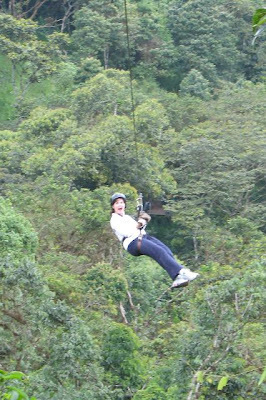 Day 2: Mindo (2 ours NW of Quito) for zip lining. First, Ron, Mom T and I did 3 lines so we could get a feel for it. Then Barby and Ron did the full 10 lines. Off we go... Her face says it all! Ron and Barby getting ready to do the full zip tour. Here are a few videos of Ron and Barby doing the "mariposa" (butterfly), then Barby doing the "superman". Here's Barby coming in from her last line "Superman" style. Next was lunch at the butterfly farm. You may remember this post about it. Day 3: Old Quito and the Basilica del Voto Nacional and the Panecillo. Day 4: Ron and Barby went hiking with some other people from the embassy. They hiked up the Rumiñahui Volcano. This picture below is Cotopaxi, another volcano that Ron has climbed. 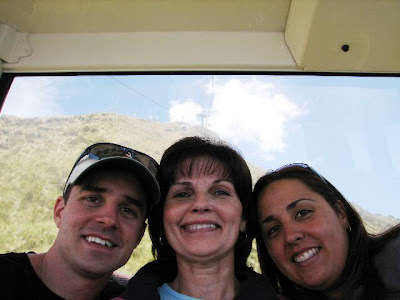 Day 5: Ron, Barby and Mom T took the Teleferico (cable car) to the top of Pichincha. Kaitlyn and I had to stay behind because children have to be at least 16 months old because of the altitude. Once at the top, they rode horses. I understand Mom T was terrified! Kaitlyn and Nana T... and a cute shot Kaitlyn eating her toes. We had a wonderful time while they were here and wish they could have stayed longer. Now we're gearing' up for Nana and Papa G's visit in a week. We all can't wait! 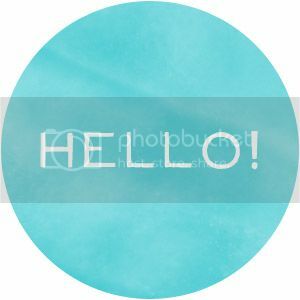 Apologies for the hiatus. It's been rather busy around here. Mom T and Barby came out for a visit last week and we had tons of fun! (Pictures to come). I wanted to quickly post this video of Kaitlyn trying green beans for the first time. This was taken on July 9. She actually loves them, even with Ron trying to convince her that they're gross. Since this video, she's had apple sauce and bananas. So far, she likes them all! BREAKING NEWS: Just a few minutes ago, while I was doing some cleaning around the house, Kaitlyn was playing on her activity mat. When I walked out of the room, she was on her back. A few seconds later I walked back in and she was on her tummy! I immediately called Ron to tell him the great news then I got out the video camera. Here she is rolling from her back to her tummy, then back again all on her own. 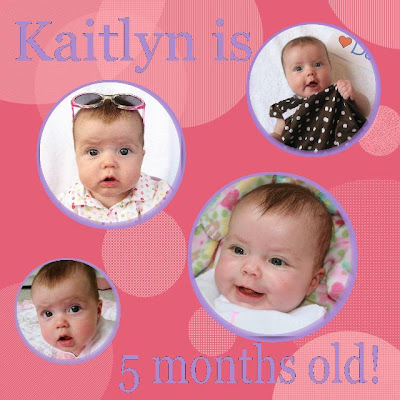 Kaitlyn is 5 months old! weighs 12 lbs. 2 oz. and is 24 inches long. 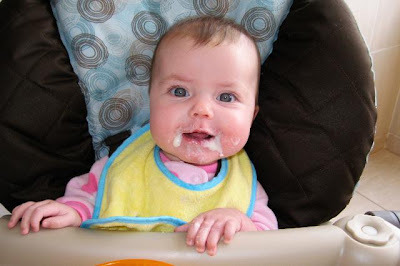 has started eating solids. It took her a while to get used to eating from a spoon, but now she's got the hang of it. 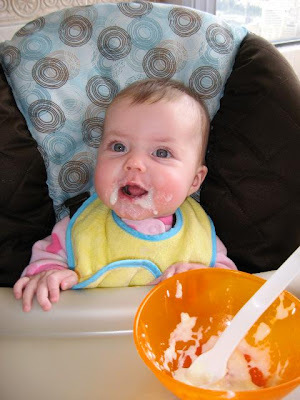 She loves her rice cereal and sweet potatoes! 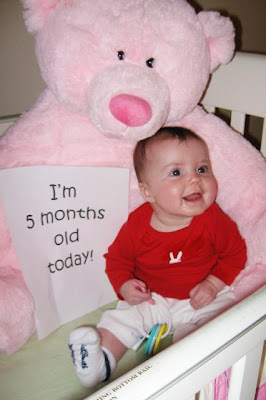 is wearing 3-6 month size clothes. is still wearing size 1 diapers, but will be moving to size 2 very soon. has rolled over from her stomach to her back. has learned to love tummy time now that her head is strong and she can look around. can't get enough of her feet. She always grabs at them and tries to stick her toes in her mouth. loves to see what's happening behind her. She'll turn her head and arch back as far as she can to see what's going on back there. will put anything and everything in her mouth. 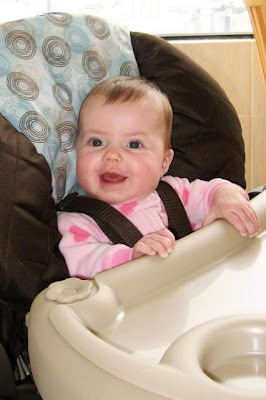 While we were in Miami, we took Kaitlyn to see her pediatrician. She said Kaitlyn is doing very well and is no longer concerned about her lack of weight gain...she's just meant to be petite. The doctor gave us the go ahead to start feeding her fruits and veggies. I wanted to wait until we got back to Quito so Ron would be there for the big event. Yesterday, was the day. 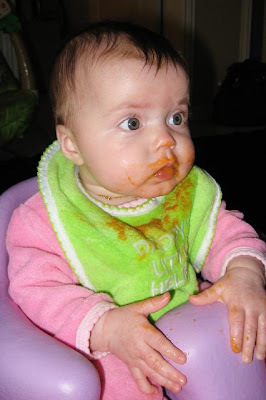 We started out with sweet potatoes and she really seemed to like it!